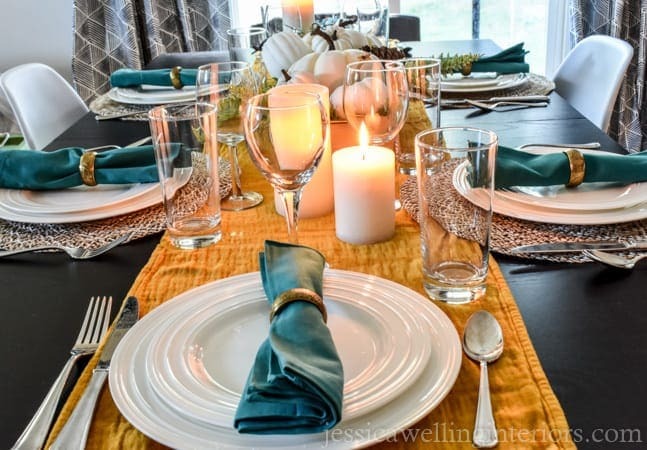 Hosting Turkey Day this year? 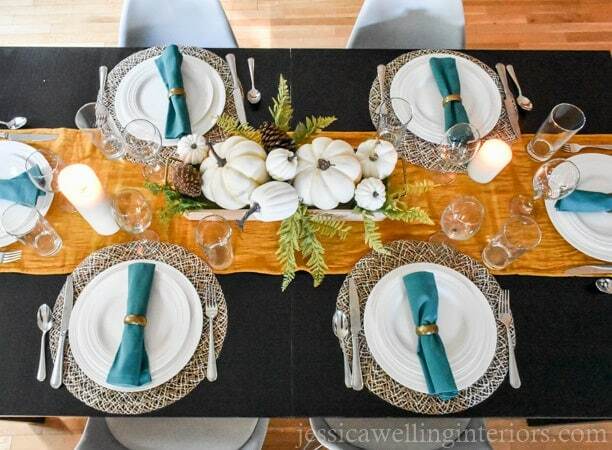 I’ll show you how to create a Thanksgiving Table Setting in 6 easy steps! Hello! I’m Jess – an interior designer, blogger, and stay at home Mama. I’m thrilled to be on the Kenarry Creative Team this year! 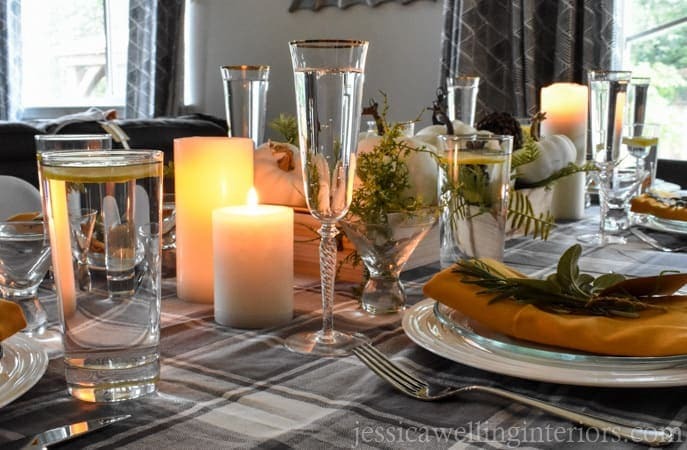 I would love for you to come check out my blog, jessicawellinginteriors.com, for more family-friendly home decor and organization ideas. 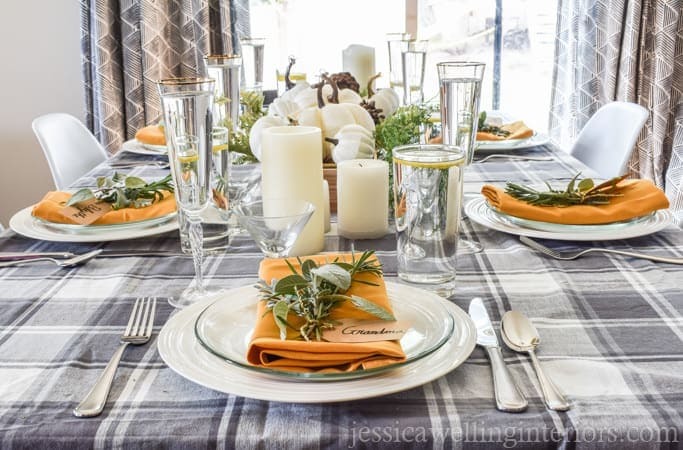 Now November is right around the corner, and it’s time to start thinking about a Thanksgiving table setting! 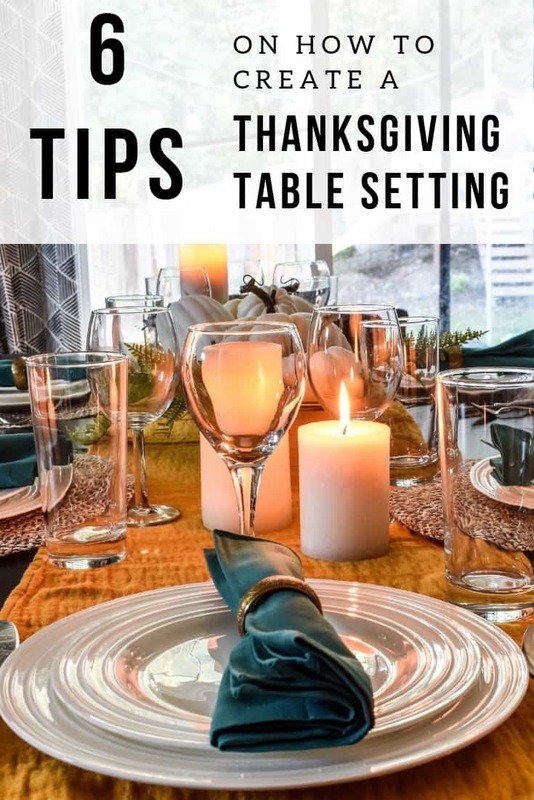 Today I’m going to show you how to create a gorgeous Thanksgiving table setting…and you can take these tips and apply them to other holidays and gatherings too (maybe minus the pumpkins). I’ll be perfectly honest here – I’ve never hosted Thanksgiving in my life. I’ve done lots of other holidays, but never Thanksgiving, because my family has a big awesome reunion over that weekend every year, and we each sign up for something and potluck it. Perfect. I kind of like the idea of hosting… but only because I’ve always wanted to decorate the table. I love to cook too, but that sounds like a cooking-hosting-marathon-nightmare, and I suspect I would be pretty unpleasant to be around for a few days before – and maybe after too – yikes! But even if you’re not hosting Thanksgiving, you can make any dinner- even a really simple one- feel special by setting a beautiful table. 1. Start with either a runner or tablecloth. A runner is great if you’ve got a pretty tabletop to show off. If not, or you’re combining multiple tables to seat a crowd, go with a tablecloth. 2. Use a low centerpiece. 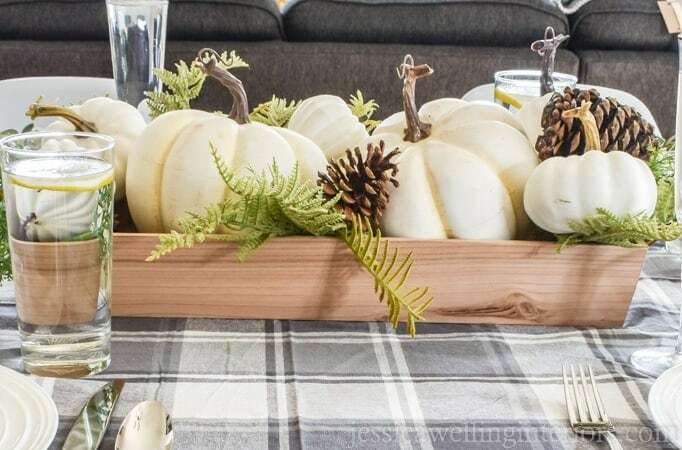 I’m loving this super-easy and versatile white pumpkin centerpiece (below). I use it as casual table decor all season. I show you exactly how to make it at jessicawellinginteriors.com. Choose something low so everyone can see each other. If you have to move the centerpiece once it’s time to eat, that sort of defeats the purpose, right? Thanksgiving is all about celebrating gratitude and abundance, and what better way to do that than to bring in things from nature? (Faux things from nature are okay too!) Beside the centerpiece, you can add natural elements with your table runner or place mats, napkin rings, place card holders, etc. Here are a few ideas: tree rounds, pine cones, twigs, leaves, pumpkins, gourds, herbs, cranberries, or moss. 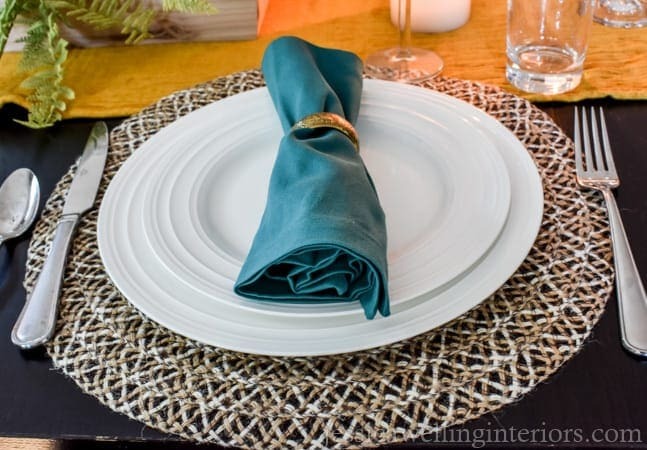 I also like to use woven pieces like the round place mats below. The key to a beautiful and interesting table setting is layers. Come to think of it, it’s the key to a good outfit, a living room, even a bed! So next we’re going to play with colors, patterns, and textures to make things pop. Start with a round place mat or charger, then add a large dinner plate. Next maybe a slightly smaller salad plate. It might be fun to use two different plates if you’ve got them. 4. 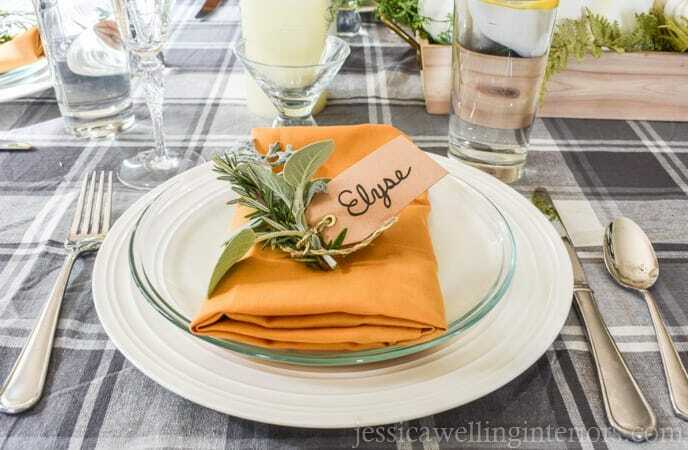 Make each place setting special. Place cards. 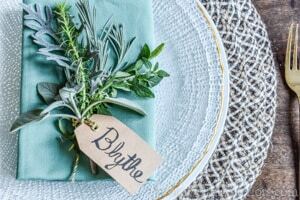 I made these super-simple herb bundle place card holders to tie in with the greenery from the centerpiece in the table setting below. See how to make them at jessicawellinginteriors.com. Cloth napkins. I love these inexpensive colored buffet napkin sets from World Market. They come in pretty much any color you could want. It’s my secret ambition to own a set in every color. Shhhh don’t tell Peter! He’ll be happier if he doesn’t know. You can also easily make your own cloth napkins. Napkin rings. Check out some of these amazing ideas from Kenarry. Something special on each plate. 5. Multiple glasses = fancy. I like to use wine glasses or champagne flutes and water glasses. The more glass on the table, the fancier your dinner will feel. I love the way candle light makes glassware sparkle! No fancy dinner is complete without candles. Load up your table with pillar candles, lanterns, tapers, tea lights, whatever you like. Flameless candles are a great option if you’ve got kiddos joining. Dim the overhead lights, and presto! If at all possible, try and set the table the day before. Thanksgiving day can be a bit hectic with all the cooking and hosting! And you wouldn’t want to miss the Macy’s parade or the dog show. It will be a lot more fun that way- and everyone can oohh and ahhh over your table beforehand. Best of luck! I hope you and your family enjoy a wonderful and delicious Thanksgiving! And try not to stress too much! 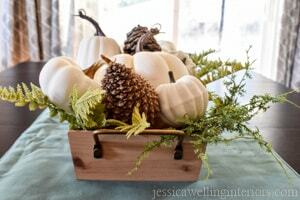 Make a Super-Easy Pumpkin Centerpiece! 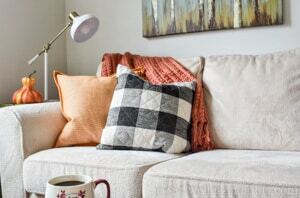 I love how you used teal with the orange and neutrals! It’s beautiful, lush, and welcoming! You have such great ideas and I’m so glad you joined in on the fun!